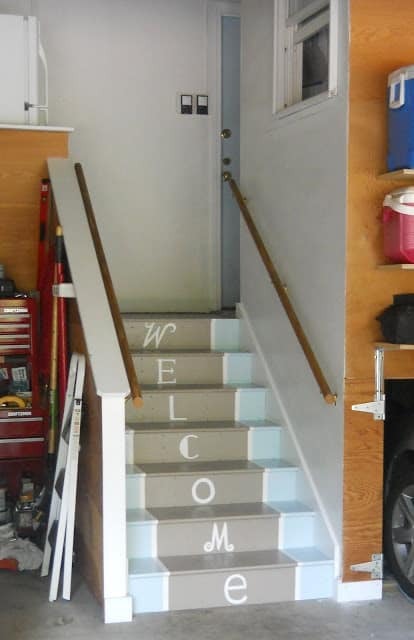 What do these stairs in my garage say to you? What stairs wouldn’t be saying that when they look so awful? I decided to go with a painted runner so I could have the functionality of – yes – dirt-colored paint, as well as a pretty coordinating color. I chose not to fill all those nail holes since this is, in fact, my garage and the main goal was to make this area a little more attractive but not send me over a cliff. See those little drips on the cement? If you let them dry without wiping, they peel right off. 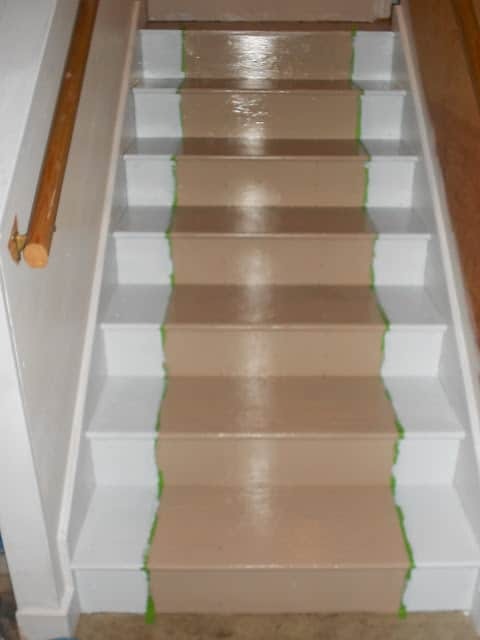 After I primed the steps, I used regular white latex to paint a stripe the width of the brush on both sides of the stairs. When that dried, I measured and taped about an inch of the white off and painted the sides Ben Moore’s “Fantasy Blue” (a fave color that I used in my last house’s master bath) and the center “Mesa Verde Tan” (BM Deck Stain – it’s true color is represented better in the second picture below). I loved how the painted runner came out but decided that a whimsical something-or-other on the risers would be fun, considering this is my garage and the main entrance for the neighborhood young-folk, so I played around with different fonts and freehanded the letters. I have to tell you that it just feels so much nicer to pull into the garage and see these stairs instead of the nasty filthiness of days of yore. They are bound to get banged up and worn down, but I think I will like them even more then. And if we tire of the “welcome” (I have been known to change things up once in a while!) 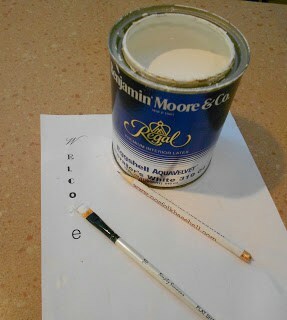 it’ll be a snap to paint right over the letters with the leftover deck paint. In addition to the stairs revamp, the landing at the top and the kooky little mudroom got some love this summer too, and I’ll be back soon with before & afters of that space. The mudroom saga will be continued! If you’re looking for more stairs inspirations, check out the board I put together on Pinterest! Thanks for visiting and hope you have a great weekend! Oh my heck that is fabulous!! LOVE LOVE! Come do that over here?? love love love the painted stairs!!! This is absolutely fabulous! I'm visiting from Just a girl, and it was the first link at the party to catch my eye! Had to come check it out! Lisa, I LOVE your stair makeover! 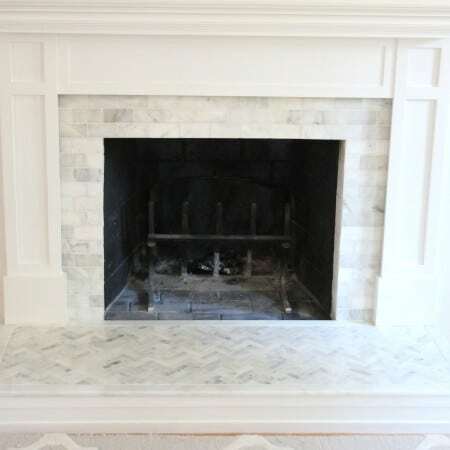 Such a great before and after! So fun. It looks awesome Lisa. We painted our garage door black and added white vinyl numbers in our last house and it completely dressed up the space. Made me look forward to coming home. Great job. You are FAByoulous!!! Truly… It makes me so happy to see these mud colored welcoming steps. You have great style and heart. Hi there! 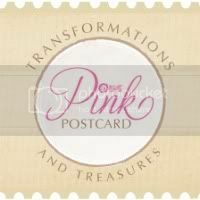 I'm new to your blog but just love everything I'm seeing! These stairs are just fabulous and I've been looking through your other posts to see the changes you have been making to your home and everything is just gorgeous. 🙂 I'm now a happy new follower! How adorable and inviting!! Great job it really looks great!! What a great project! You just gave me some ideas for my dingy steps that go into my basement. There is hope. Not just to get the umph. 🙂 Bookmarking! That is such a great project and what a simple way to brighten a spot in the house that most would overlook. Great job! Totally Fab! (as the young neighborhood folk would say). You better get a major supply of popcorn, because with stairs like this and then saying Welcome that really looks like a "Welcome" you will never get the young folk to leave. "stop by again when you can't stay so long" on the back of the door or something. (this is what my Mother in Law used to jokingly say when we stopped by) Love her. But, I guess a sweet Till Soon somewhere would be nicer. Well, you did an awesome job. Love it. This is so wonderful! The colors, the fonts, the idea – all genius. Thanks so much for sharing! Oh my goodness lisa this is awesome! What a increadible way to walk into your home, so inviting and warm! Love love love this! This is such a great idea!!! 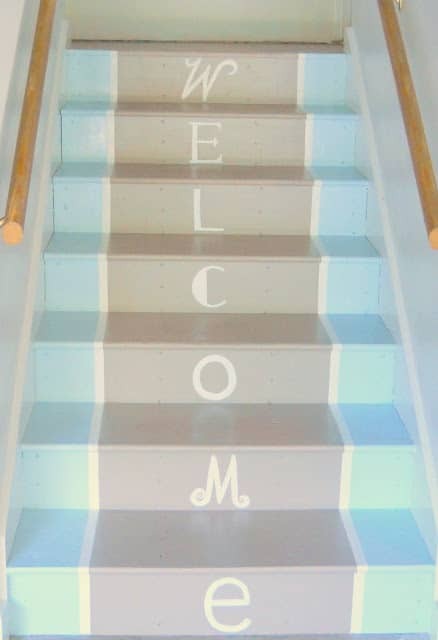 Your stairs look so gorgeous and of course,welcoming! I love this! Best wishes and hope you have a great week! I really love it! You are so inspiring- my staircase to our studio barn is so dreadful, this would look fantastic. I will let you know!! So cute. I saw this on Just a Girl. What a brilliant idea. Love it! I love these stairs! Thet look great! Thanks for your nice comment over at my blog. Hope you'll visit again soon! brilliant! found you via flaunt it fridays. What a great idea! I love the colors. i'm a new follower. I hope you'll stop by! Lisa, I'm so glad I found your blog. 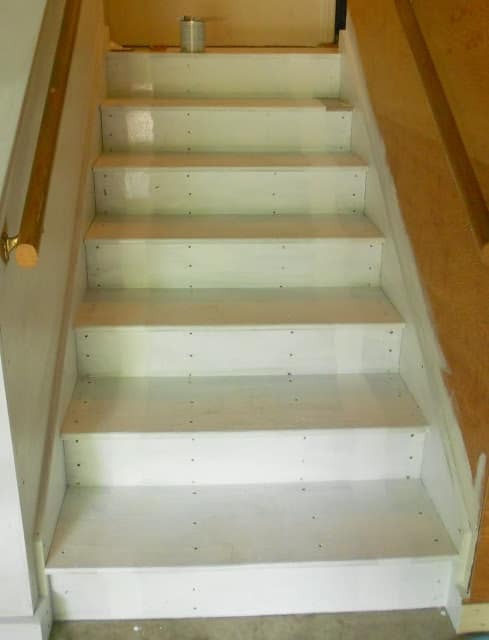 Those stairs are amazing…what a transformation! that is so funky and fab ! Great idea! 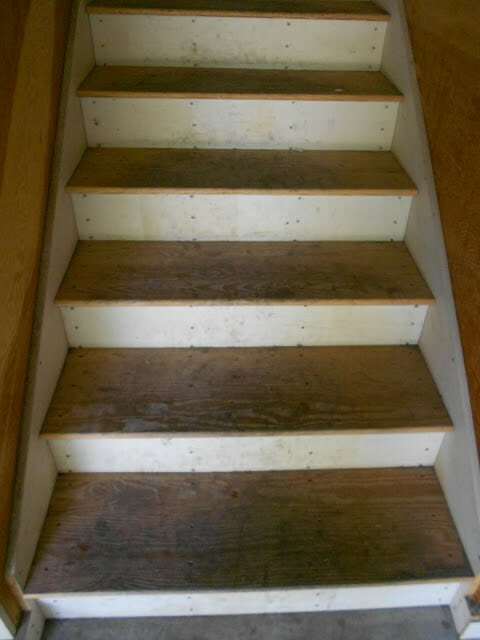 I have some stairs I want to rip carpet off and do something fab looking….Just like this!!! Update after 2 years: our stairs have held up pretty well – definitely showing wear after being the main entrance for a family of 5 plus a St. Bernard. I am going to give them a fresh coat of paint this year along with a coat of polyurethane which I didn't do last time and I think would contribute to the finish lasting longer. 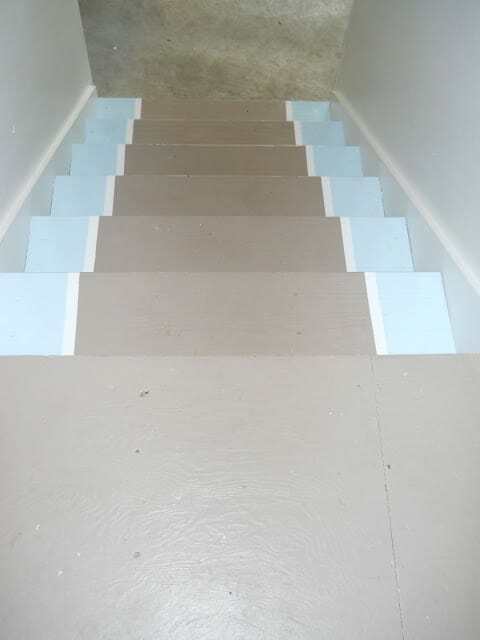 I'm glad I painted the stairs and I knew going into the project that they would get worn over time but I still think they look so much better than unpainted, plus I am able to mop them. I would recommend doing it! !